Every holiday season, I bake Russian tea cakes, also known as Mexican wedding cookies, snowball cookies, and polvorones (a traditional Spanish Christmas cookie), and share them with friends and colleagues. Popular around the world, as the various names suggest, these crumbly, buttery shortbread cookies are filled with nuts and rolled in powdered sugar. This is a twist on my favorite Russian tea cake recipe, from The Good Cookie, by Tish Boyle. Prepared with cocoa powder, roasted chestnuts, and vanilla, and sprinkled with a snow-like dusting of confectioner’s sugar, they are the perfect winter treat. Preheat oven to 325 º F and line two baking trays with parchment paper. Roast and peel chestnuts, and place in food processor bowl. In a small mixing bowl, stir together flour and cocoa powder. Measure out two tablespoons of the flour mixture, and add to the food processor bowl (this will prevent chestnuts from turning into a paste when processed.) Pulse until chestnuts are finely ground. Pour chestnut mixture into the bowl with the flour and cocoa powder. Add salt, and stir until thoroughly combined. In a large bowl, cream together sugar and butter by hand or with a mixer until light and airy, about two minutes. Add vanilla extract. Stir in chestnut and flour mixture until just combined. 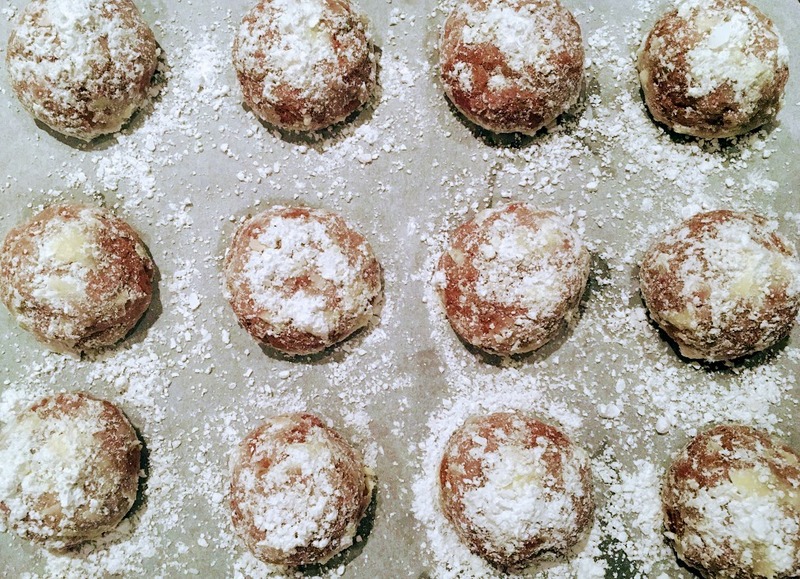 Scoop heaping tablespoons of dough and roll into balls using the palms of your hands. Place cookies about an inch apart on prepared baking sheets. Flatten the tops slightly with your fingertips. Bake for 18-20 minutes, until firmly set (check the bottoms of the cookies; they should just begin to turn golden brown.) Let cool for five minutes. Place 2/3 cup confectioner’s sugar in a bowl, and roll cookies in sugar until thoroughly coated. Sprinkle additional powdered sugar on top before serving.